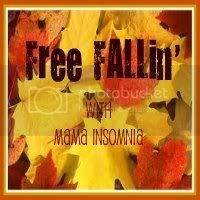 MamaInsomnia: Get Ready to Free FALL!! Get Ready to Free FALL!! Fall is my all time favorite season. EVER. There is a crisp coolness in the air, but it is still nice enough to do things outside. What do you like best about Fall?? *A DIY fall decoration or craft idea. *Football-Fan or not?? If you are, why is your team the best?? *Not a Fall fan?? Tell us why and what season you prefer! The link up goes live Monday the 22nd at midnight and will run all week. Feel free to link up as many posts as you'd like but please make sure each link up is directly to a specific post. So get your posts ready and link up on the 22nd! !